Jonathan Ive thinks he's hot feces because he designs sleek laptops that get widely copied and accoladed and all that. That's great for you, Jonny. But you know what he's never done? Designed an iconic car. Not even once. You know who has? Kumeo Tamura, one of the designers of the classic Datsun 240Z and the designer of the pioneering laptop computer, the Ampere WS-1. That, right there, that's the ultimate double-whammy for an industrial designer. Designing the two things you own most desirable to thieves: your car and your laptop. 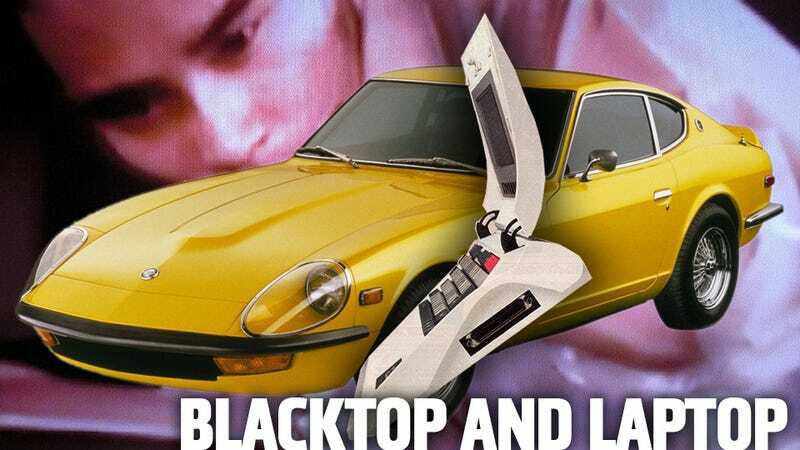 I'm fairly confident most readers know about the Datsun/Nissan Z car. It's one of those automotive icons any gearhead recognizes immediately. It was the poor-man's E-Type of it's era, and much of its success was due to its sleek design. Many people were on the team that created the Fairlady/240 Z, but it was Tamura's version of the design that became the Z car we all know. Much less known, but equally striking in its own way, is the very early laptop Tamura designed for the Ampere company in 1984, the WS-1. Personal computing was still relatively new back in the 80s, and portable computing usually still meant a huge suitcase-sized brute with a tiny CRT. Laptops as a general design idea were still so new no one had decided exactly what to call them yet. 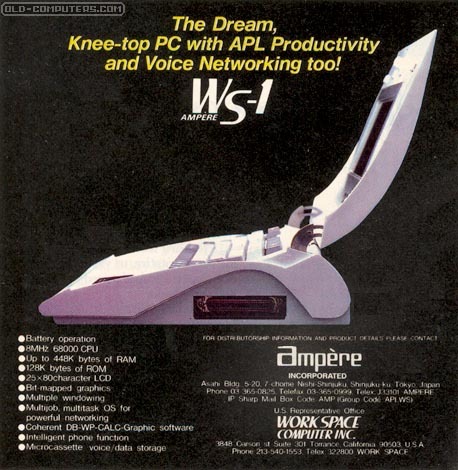 One ad for the Ampere WS-1 refers to the computer as a "knee-top." Which I guess is better than the never-popular "crotch top." The laptop itself is pretty unusual, spec-wise. It uses an early instance of the Motorola 68000 running at 8Mhz (the original Mac's CPU) and came with a staggering 64K of RAM, a 300K microcassette drive built-in, and a 480x200 monochrome screen. Single icons are bigger than that screen now. It also used an uncommon programming language called APL (which stands for, get this "A Programming Language"), a high-level language that uses all kinds of bonkers symbols like arrows and triangles and probably hawk's heads and stuff. Even more striking than its specs or odd programming language choice is the striking design. When closed, the laptop has a cross section like an airplane wing. Very sleek, very unusual for portable computers of the era. When open, the laptop shows other innovative design features, like function keys directly beneath the monitor. The WS-1 failed US FCC testing, so it never was sold in America. Which is a shame, since it would have made an excellent counterpart to the great number of 240Zs that were sold in the US. I'm pretty sure this is the only example of an automobile designer also designing a real, production computer. I may be wrong, and if I am, that's why we have comments. But nobody bring up those inane laptops painted red with a Ferrari logo on them. Those don't count.